In the previous entry I talked about the electrical signal or action potential that’s fired and acts as the initial communication in the nervous system. In this entry I’ll cover the network upon which that signal travels, as well as a few other related and interesting topics. The network of our nervous system is not so different from the electrical system in our homes, it’s just a lot more complex. And gooey. There is the central nervous system (CNS), which is comprised of our spinal cord and our brain, and is sort of like our fuse box. And then there are all the wires emanating from the CNS to our limbs and extremities. This is the peripheral nervous system (PNS) and is akin to the wiring that winds through the walls of a home. It starts at the point where nerves extend from the spinal cord and runs to the ends of our limbs. The sciatic nerve is probably the longest axon (nerve fiber), running from the lumbosacral plexus L4-S3 (you’ll understand what this means in few paragraphs believe it or not) to our big toe. Also, the PNS is divided and categorized several times–first into the somatic (voluntary movement) and autonomic (involuntary movement) systems; and then the autonomic system is broken down into the sympathetic and parasympathetic systems. More on that later. So, again thinking back to Part I of the Nervous System, the impetus to all activity in our bodies is a change in the action potential–a change in the electro-chemical charge of ions in, and surrounding, our cells and in this case, our neurons. The action potential, or electrical charge, travels the length of an axon toward the brain. 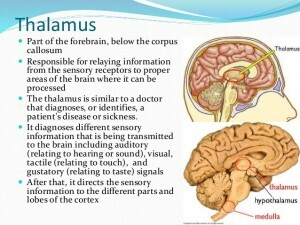 The signal makes connections along the way; first in the spinal cord, then in the thalamus, and lastly in the cerebral cortex. Different types of signals have different “tracts”, or paths on which they travel. 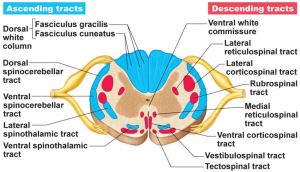 For example, the spinothalamic tract conveys touch sensory data and crosses over–decussates–to the opposite side of the spinal cord before continuing on to the thalamus. So the message of a bump to the right leg will travel up the left side of the spinothalamic tract. 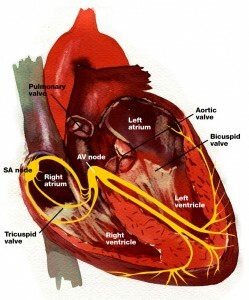 It is an ascending tract, meaning that the signal is moving from the PNS to the CNS. It’s important for medical professionals to know all the tracts and possible ways that information travels to and from the brain as it helps in narrowing down the specific location of a spinal cord injury. For example, some tracts communicate touch sensors, others pain, and others temperature, etc. Ascending and descending tracts of the nervous system. The central nervous system, or CNS, includes the brain and the spinal cord, which travels uninterrupted from the brain stem to the lumbar vertebrae. The spinal column is made up of 33 different bones called vertebrae, each with a hole in the center, through which the spinal cord travels. Of the 33 vertebrae, 7 are in the cervical region, 12 in the thoracic region, 5 in the lumbar region, 5 in the sacral region and 4 in the coccygeal region. Most of us know that spinal injuries are very serious, but do we understand why? 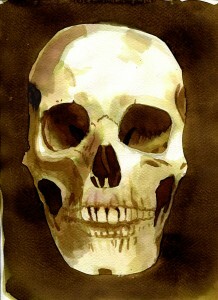 It’s not a broken vertebrae that serious although that shouldn’t be taken lightly–bones heal. Because nerve fibers in the central nervous system (brain and spinal cord) rarely regenerate, such damage is irreversible. 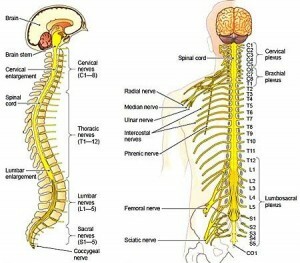 If the spinal cord is severed, there is no neural communication getting past that point, which is why injuries higher up on the spine are more deadly; if the cord is injured above vertebrae C4, we lose neural communication and use of all limbs, but if the injury is below T11, we lose use our upper limbs only. The phrenic nerve, which extends from the area between vertebrae C3-C5, leads to our diaphragm and controls our breathing; obviously any damage above or to that nerve could be life threatening. So far I’ve covered a lot on voluntary sensory communication–you get cold and put on a jacket, or your finger gets burned so you move it away from the heat–but a lot of our neural communication happens behind the scenes. The autonomic system that I mentioned earlier controls all involuntary neural communication. Again, it’s divided into the sympathetic and parasympathetic systems and they are almost opposite in their affect on the body. It basically mobilizes all our resources toward functions primarily tasked with quick thought and action. An important aspect of how an action potential travels on an axon is called saltatory conduction, which means that the action potential leaps across the axon as it travels. This greatly speeds up transmission of the signal and is integral to survival. This is possible due to the basic structure of the axon: it’s divided into sections by a type of fatty insulation called a myelin sheath. The small space in between each myelin sheath is the node of ranvier, and acts as the hopping point while the myelin insulates and accelerates the signal. The movement of newborns is jerky because their myelin sheaths are not fully mature; as a result the stimulus or action potential travels along the axon in an irregular, uncoordinated way. Many diseases are the result of demyelination, the most common being multiple sclerosis. In MS, the myelin sheaths in the CNS are damaged, which disrupts saltatory conduction, i.e., the ability of parts of the nervous system to communicate. The results are a range of signs and symptoms, including physical, mental, and sometimes psychiatric problems. Parkinson’s is also a degenerative disorder of the nervous system, with progressive impairment or deterioration of neurons in an area of the brain known as the substantia nigra. This part of the brain plays an important role in reward and movement, which is why Parkinson’s sufferers not only have physical symptoms (shaking) but also commonly have problems with impulse control. A few weeks ago I had my last day as a CNA in a convalescent home. In no way did I anticipate what an emotional experience that would be. My almost two years in that position were, without a doubt, the hardest thing I’ve ever done. I was hit, scratched, spat on, cursed and yelled at, vomited on, had urine splash on my face–and once had projectile, bloody diarrhea hit my face. Fortunately the communicable diseases spared me. I’ve cared for people who weigh over 300 lbs., have C. diff, and have no ability roll over. let alone stand up. This means that the CNA needs to roll their body over for diaper changes, which are frequent with C. diff. Some patients don’t want their nasty, soiled, diaper changed, and push back on the wall as hard as they can while you try to push back with one hand and position the clean diaper with the other. I worked in a “no lift” facility but everyday lifted several people from the bed to the wheelchair. Yes, I’m massaging my own back right now. 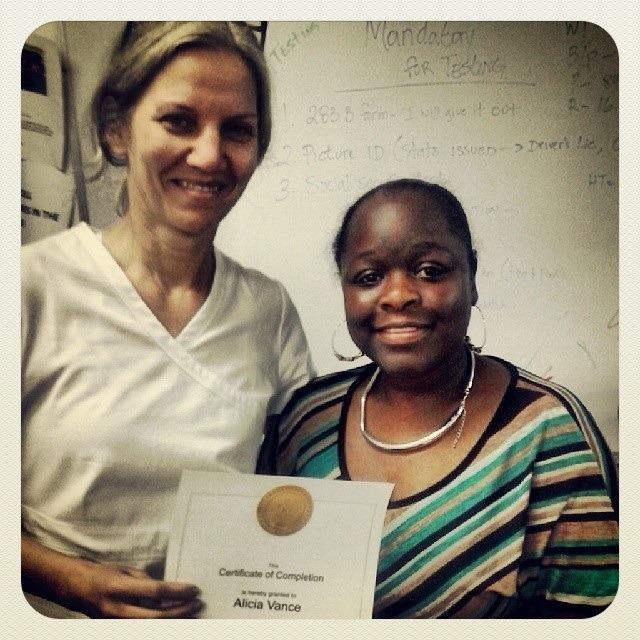 Receiving my CNA certification, May 2014, with my teacher Abigail. Most of the patients were really wonderful–being old can make one aware of their own vulnerabilities, and very tender and appreciative. But sometimes it’s the opposite, and some are struggling with serious issues. Imagine being an older woman with Alzheimer’s, in a nursing home, with no family visiting ever. I can’t imagine how vulnerable that would feel (and hope I never do). Unlike the hospital, in a convalescent home the CNA spends more time with the patients/residents than anyone else on staff. The care in this setting is generally not urgent–for the most part the patients require help with bathing, toileting, dressing, and sometimes feeding. Because of the longer length of residency, CNAs get to know patients pretty well and are also responsible for reporting any changes in behavior–confusion, lethargy–and are usually the person present when things do become urgent, due to a fall, a stroke, or simply due to dire health that on a typial day is not quite bad enough to require hospital care. RN and LVN positions have government imposed nurse/patient ratios, but that’s not the case for CNAs. It’s determined by the facility, and mine was about average–about eight patients during the day shift. It doesn’t sound like a lot–you might think “oh, eight patients, that gives you an hour with each person”. But we also pass breakfast and lunch trays, help feed some, change linens, take and record vital signs, and chart everything we do in the day for each person–did they eat, how much did they eat, are they self ambulatory in bed, out of bed, in the wheelchair, do they use a walker, do they need help getting dressed, how much help, did they have any snacks, how much, did they have any bowel movements or urinate, how many, at what time, was the stool hard, soft, or watery, do they have a catheter, how many cc’s of urine was collected, did they shower or sponge bath, how much help did you provide, did they leave the facility for any reason, were they turned and repositioned every two hours, etc. It’s A LOT of work. I made $12 an hour, which was more than most of my co-workers. The health benefits, had I taken them, would have cost $900 a month for me and my family. We waived them and continued with our individually purchased plan, which was cheaper. My heart goes out to several co-workers who have worked that job for 10+ years, are wonderful, and such care for the residents as if they were their own family. They taught me so much, most importantly, what is true of every nursing job: that it simply is not ever, about you. A quick note to promote Coursera, an aggregator of online classes–if you’re planning to take Physiology anytime soon, I highly recommend taking it here first as a primer, especially if you have no familiarity with the material. The Duke University curriculum and instructors are excellent–and free! You should also consider it if you’ve already taken physiology but feel like you need to brush-up before taking the NLN PAX. Now on to the nervous system–our nervous system, like the circulatory system, engages every part of our body. But instead of veins, arteries and capillaries, it’s comprised of axons, dendrites and glia, conducting electricity. Working in conjunction with the muscular system, it allows us to move and breathe. 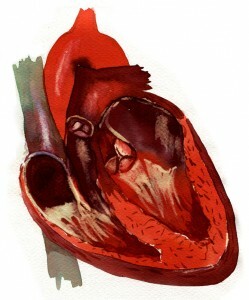 And because the heart is a muscle, it keeps the engine of the circulatory system humming. It helps to keep our vitals systems in homeostasis by communicating dangerous rises or drops in blood pressure, heart rate, pH, O2 and CO2 levels and sometimes releases neurotransmitters into the blood to move these systems back to setpoint. Lastly, it communicates a variety of sensory messages to the brain. So how does all this communication happen? There are two main components: the electrical signal, and the network on which it travels. The fluid inside and surrounding our cells (intracellular fluid, ICF, and extracellular fluid, ECF) is filled with chemical elements—mostly sodium (Na), Potassium (K), Calcium (Ca), and Chloride (Cl). If an element has more or fewer electrons than protons, it has an electrical charge and is called an ion. The charge is measured, + or -, in millivolts (mV). Remember that. A plasma membrane, the protective wrapper of the cell, separates the ICF and ECF. The mix of ions in the ICF and ECF determines its voltage, and the difference in voltage between the ICF and ECF determines the membrane potential for that cell. For example, at rest, most neurons have lots of K+ in the ICF and lots of Na+ in the ECF. The difference in voltage is about -70 mV, and this is the resting membrane potential (RMP) for the cells of our nervous system, aka neurons. When a stimulus occurs–the smell of pancakes, a sting on your leg, even a slight breeze on the hairs of your forearm–voltage-gated Na+ channels on the plasma membrane open and Na+ rushes into the cell. This changes the difference in voltage between the ECF and the ICF and the membrane potential rises–depolarization of the neuron begins. Remember, it starts at -70 mV, the RMP. If the stimulus is strong enough, and enough Na+ moves into the cell, the membrane potential rises to +30 mV, and an action potential, or electrical signal is fired. The action potential then travels the length of the axon to your brain, where the stimulus is registered and another signal is sent from the brain to your muscles–you decide to eat pancakes, move your leg, or put on a jacket. In the center, the signature of an action potential. 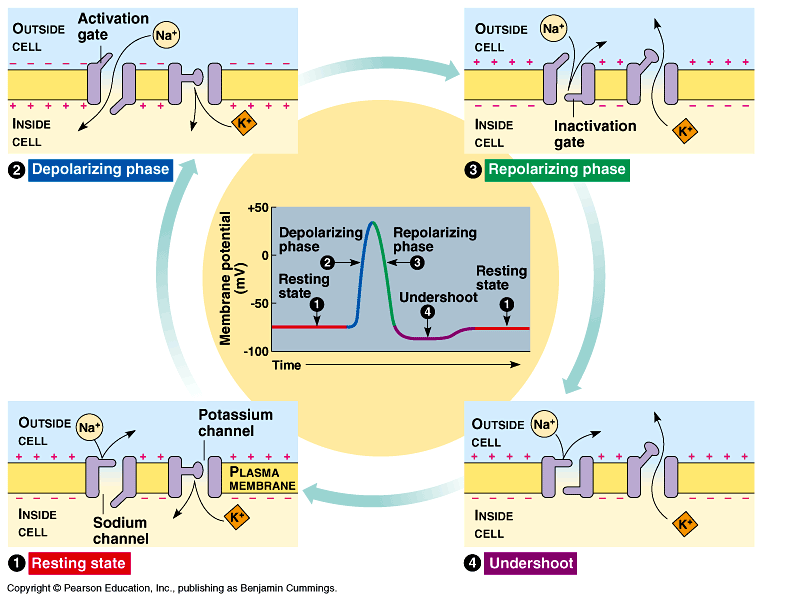 Around it, the phases of cell depolarization and repolarization. Once the membrane potential reaches +30 mV and the action potential fires, the Na+ channels shut and the cell repolarizes. If the stimulus continues, another action potential is fired. Of course this all happens in femto seconds and is happening in more than one neuron–your fingertips have as many as 100 touch receptors per cm2. An example of a medication that tweaks our nervous system, as many of our medications do, is lidocaine, which binds and inhibits voltage-gated Na+ channels. Liocaine is what the dentist injects into your gums before drilling your teeth. By inhibiting the voltage-gated ion channels of the neurons in your gums, there is no Na+ entering the cell, no cell depolarization, no action potential fired–no stimulus of the pain/nociceptors, and no pain felt.